Sue's ITH Purse- I had fun making these. They were easy and unique. I tried one with cut-a-way stablizer to make them more stiff but I went too far and added it to the pockets also. I liked it but it made the seams a bit heavy. 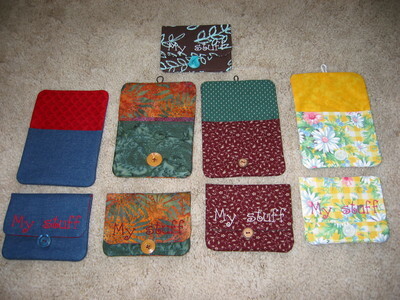 I also added another pocket divider to several of them. That worked out well. I thought if used for cards it would divide them such as gift cards vs. other types. I made two of each fabric. I really liked how the denim worked since it gave it more body without extra stablizer. My elastic came out of one so I'm going to add a snap when I get to the store. They will be given to my quilt guild for their Quilt Show. They want crafty items to sell at a booth. I thought these would be perfect. Thanks Sue for a great project! Thanks for commenting and looking at my project. Mass production! I really like them in denim as well. They have a really sturdy feeling. I like that fabric second from the left as well - is it a batik? Yes, that is batik. I've made many things out of it. (some of which is way back in projects) I won them at the quilt guild. There was about 1 yd of 4 fabrics. I'm getting down to small pieces. Thanks again for the design! Nice idea to use them to give a gift in. Your collection is amazing as is you. Do you ever come up for air?..thank you for your ideas and trouble shooting..p.s quite paetial to the floral one, very delicate.. Thank you very much. The materials are left overs from other projects thro the years. Nice collection of pouches. Very useful as well!! your Quilt Guild will be quite happy with them. Thank you. I just sorted through my drawer of collected buttons. I was lucky to find something that worked. Thanks, Yes they were fun to do. terrific fabric choices on all of them there are addictive for sure! Thank you very much. They are addictive. I may just do some more to use with gift cards next Christmas.